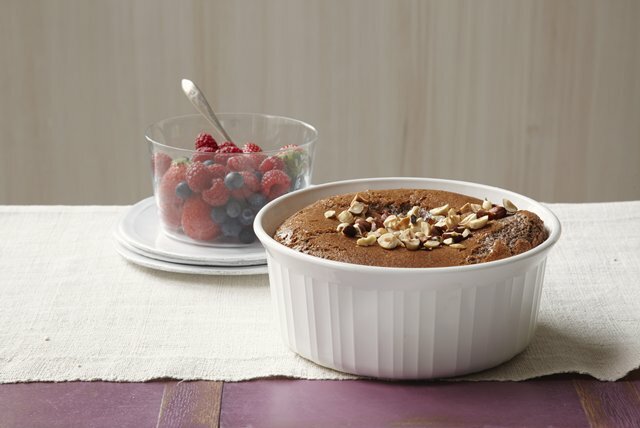 Yes you can make this Dark Chocolate-Hazelnut Soufflé! Watch this video to see how simple it can be to whip up this famous dessert. Grease bottom and side of 1-qt. soufflé dish or casserole with butter; sprinkle with 1 Tbsp. sugar. Blend eggs, cream cheese spread, remaining sugar, liqueur and chocolate in blender 30 sec. or until smooth. Blend on high speed 15 sec. Pour into soufflé dish. Bake 40 to 45 min. or until puffed and lightly browned. Sprinkle with nuts; serve immediately. Looking for a special treat? One serving of this soufflé is full of chocolatey flavor. Serve topped with mixed berries. Substitute 1 tsp. almond extract for the liqueur and PLANTERS Slivered Almonds for the chopped hazelnuts.